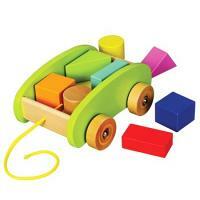 Description: The Pull Along Mini Block Cart is made of natural wood, painted green with spiral graphic wheels that are fun to watch when pushed or pulled. Eight simple shapes are included that can be stacked and un-stacked in the cart. Included are 2 of each shape, a square, circle, trapezoid and rectangle. The Educo brand has meant quality and innovation in toys for over 30 years.